I've been bullet journaling for over 2 years now, and during all this time I've used and tried various notebooks. More specifically I've used a Moleskine, a William & Hannah one, a Jane's Agenda notebook, lots of Leuchtturm1917 ones and my last one has been a Scribbles That Matter notebook. I'm always keen to try new notebooks! I love testing the pages and creating in them! 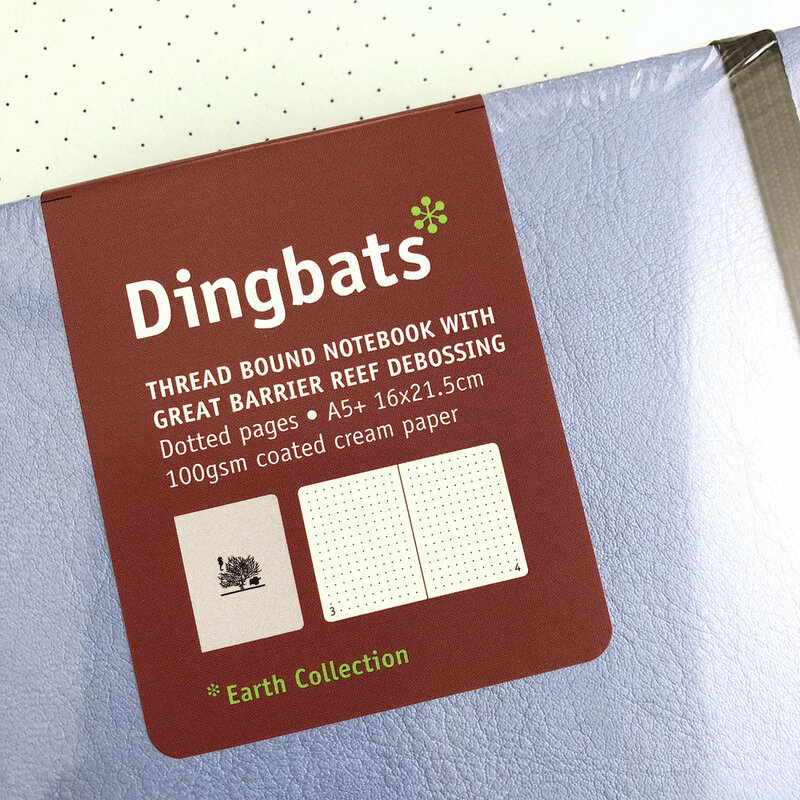 I've been wanting to try the Dingbats notebook or a while now. I kept on hearing lots of good reviews about it, and a few YouTubers that I follow use one. When the Earth Collection was released, I knew I had to buy one. And since my 4th bullet journal is almost finished, I was just about to make a purchase. The lovely people from Dingbats were kind enough to send me one of their notebooks for review and of course I jumped at the opportunity! It arrived perfectly packaged within a few days! And I have to tell you, it was love at first sight! I've chosen the 'Great Barrier Reef' one from the Earth Collection in A5 size, with dotted pages which comes in a lovely sky blue colour. The pictures just don't make justice of how pretty the colour and the design of this notebook is! The quality is amazing, the finish and the details of the design are exceptional. And as you can tell I'm very pleased with my new notebook and I can't wait to start creating in it! 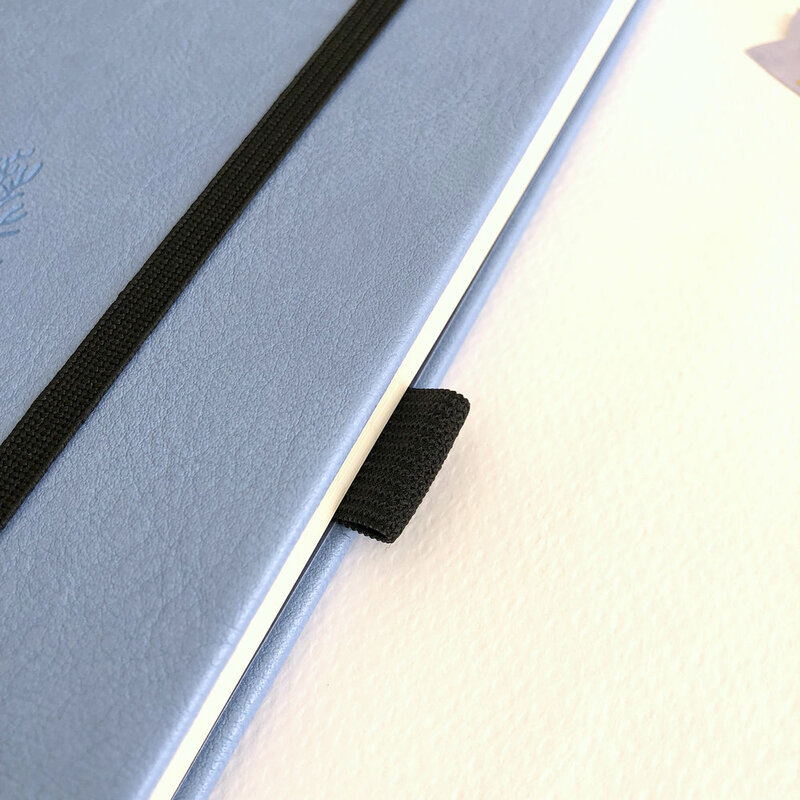 There is an elastic band in black colour to keep the notebook closed, and a pen holder. 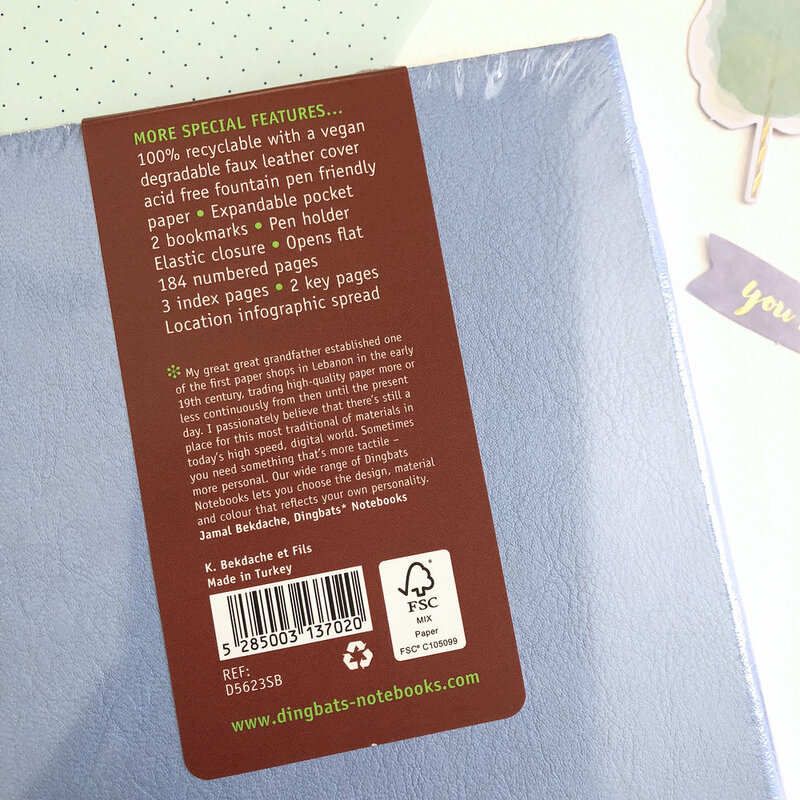 The cover of the notebook is very soft and smooth. It is bound with pearlescent PU leather (100% vegan) with a Great Barrier Reef debossing. I love how cute and elegant it looks! 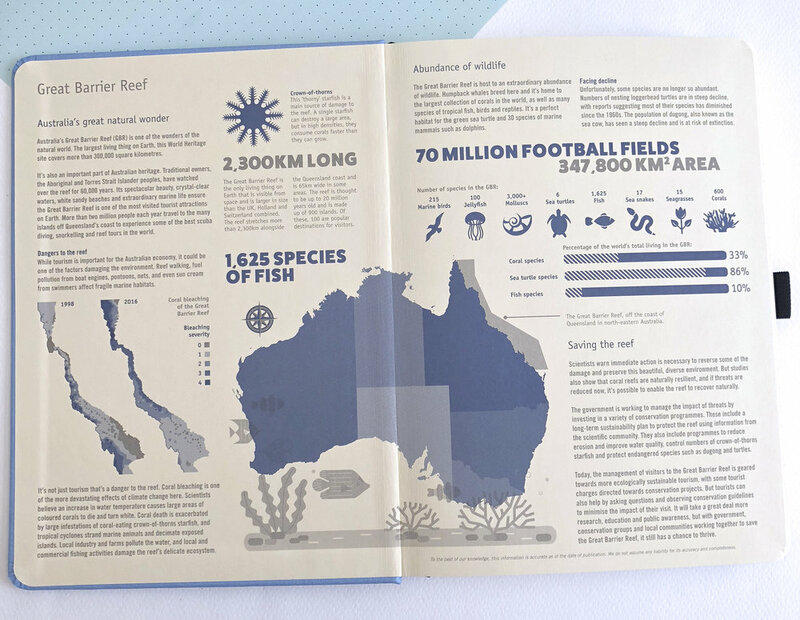 Printed on the inside cover of the notebook is an infographic spread for you to explore more about the reef, its threats and how we can help save it. The next page is this lovely blue page full of fish, corals and turtles, which I think is such a lovely touch. And on the opposite page, it has a section for you to write your name and all your details, which I really like. Then there is a page with a guide which explains how to use the new feature of page tabs that are included in the notebook, and get the most out of it. It also shows how to create your own key. So, on the Tab Key page, you can create a list of categories of the pages you'll create in your bullet journal. For example, you can write Monthly Spreads, Weekly Spreads, various collections you might have on certain topics like family, finances, health, travel etc. You can add and personalise your notebook any way you want! Then you assign a colour for each one of the above topics and you colour the corresponding tab on your key page. These tabs are on all the pages in the notebook, and so as you write in your journal you apply the appropriate colour to the tab on the page. So, even when your notebook is closed you can easily identify items through the colours on the visible edge. I think that it's such a cool idea and it makes it easier for you to find things in your bullet journal! Then you can turn the page and create your own Colour Key and add your own signifiers for the things you want to log in your pages, i.e. your tasks, birthdays, appointments etc. Moving further, there are 3 pages for the Index, which I really like. It gives you plenty of room to write things down, and to also categorise your topics. Then there are 4 pages dedicated to Future Log. There are also lines at the edge of the pages that help you create a grid if you want for your future log. too. At the back you also find the back pocket that, as you can see in the picture below, it has those designs I mentioned before, throughout. These details add to the quality of this notebook. You also get a little leaflet with all the various collections and lots of information on their products. There's two bookmarks in two different colours - blue and black. The pages are numbered. 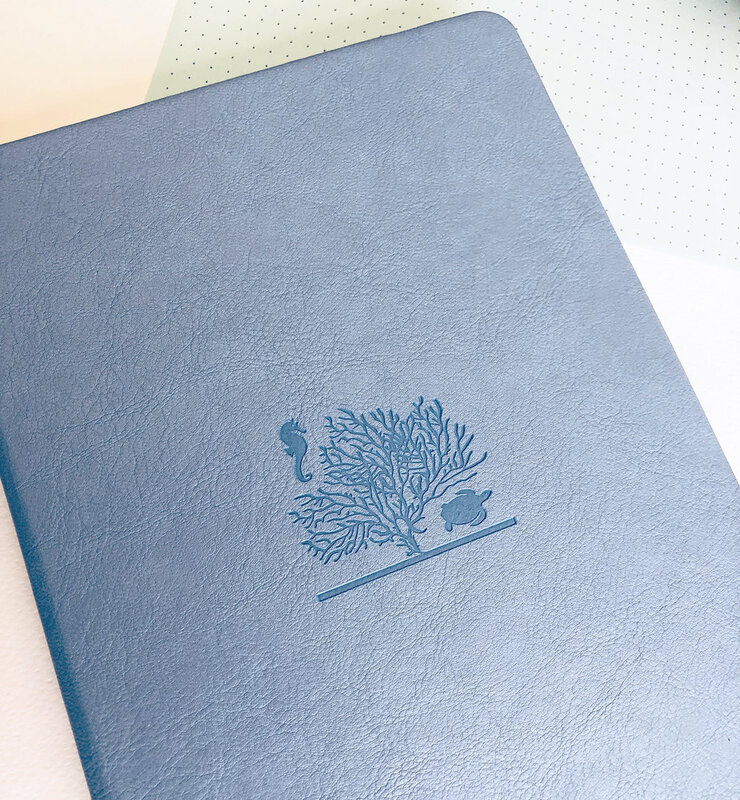 Each page is of 100gsm coated cream fountain pen-friendly FSC-certified paper, with a total of 96 sheets or 192 pages. And the notebook can open flat. The dots on the page are 5mm apart (like the Leuchtturm1917), and they are in light grey colour. It has 28 boxes horizontally and 39 vertically, which is slightly bigger from any other notebook I've used. To compair, Scribbles That Matter has 26 and 37 while Leuchtturm1917 has 26 and 38 respectively. I have to say that even before I wrote on this notebook the feel of the pages was a m a z i n g!!! I don't have any other notebook that it's pages feel so good to the touch! I'm impressed! After creating a pen test page at the back of the notebook, with all my most used pens and markers, I have to say that I'm in love! 😍 Apart from the Fudenosuke brush pen (hard), which I admittedly pressed a bit more than I should for some reason, everything else is almost not even noticeable at the back of the page. Very very slight ghosting, even with my fountain pen! I'm very pleased with my new notebook and I can't wait to start using it and setting it up! What notebook are you using for your bullet journal? Have you used a Dingbats one before? What do you think of them?